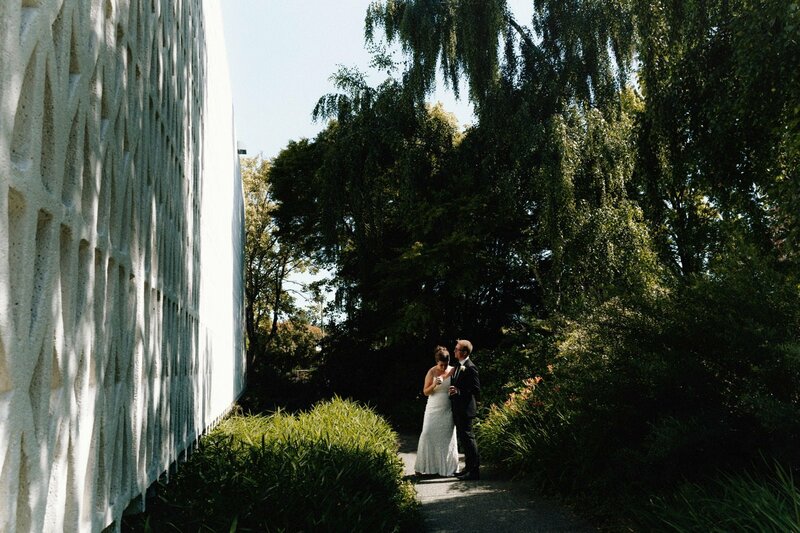 A preview of Jude & Wes’ intimate MOV / Museum of Vancouver wedding one sunny Tuesday in Kitsilano. These two lovely, globetrotting humans (who I narrowly missed while traveling around Japan this year) took a break from their adventures to get married in a city they both called home for the past several years. Their wedding was quintessentially Vancouver: traveling to their ceremony venue (Museum of Vancouver) via a False Creek ferry; getting photos done in the Neon Vancouver exhibit at the MOV with a special nod to Wes’ love of Canadian band 54-40 via the Smilin’ Buddha Cabaret sign; dining and dancing with a glorious view of English Bay. We knew we wanted our wedding to be outside, and MOV was quiet and secluded but offered great views across the water towards the city. We placed greater emphasis on the reception location as this is where we would be spending most of the day. Beach Bay Cafe stood out in our search because we loved the aesthetic and location. The wood and cream interior is simple and minimal which matched the style we were going for. We’ve really tried to remove any aspect of a wedding that we didn’t want to have or like. There is no walking down the aisle because there won’t be one, no being given away, no formal wedding party. From the guests’ perspective, we hope the most important aspects are a good meal and good social atmosphere. From our perspective, the photographs are the most important—with so much happening on the day, it’s hard for us to see it all and take it all in. The photographs will form an important part of journaling the day for us to look back on. Capturing the day, and to some degree, the city itself, is even more important because we aren’t going to be living in Vancouver after the wedding.